The King of Saudi Arabia is Saudi Arabia's absolute monarch who serves as head of state and head of government. He is the head of the Saudi royal family, the House of Saud. The King is called the Custodian of the Two Holy Mosques (خادم الحرمين الشريفين), a title that signifies Saudi Arabia's jurisdiction over the mosques of Masjid al Haram in Mecca and Al-Masjid an-Nabawi in Medina, replacing His Majesty in 1986. King Abdulaziz (known in the West as Ibn Saud) began conquering today's Saudi Arabia in 1902, by restoring his family as emirs of Riyadh. He then proceeded to conquer first the Nejd (1922) and then the Hejaz (1925). Ibn Saud proclaimed his dominions as the Sultanate of Nejd in 1921, shortly before completing the conquest of the region. He was proclaimed king/malik of Hejaz in 1926, and raised Nejd to a kingdom as well in 1927. For the next five years, Ibn Saud administered the two parts of his realm as separate units. In 1932, he formally united his territories into the Kingdom of Saudi Arabia. The kings since Ibn Saud's death have all been his sons, and all likely immediate successors to the reigning King Salman will be from among his progeny. Sons of Ibn Saud are considered to have primary claim on the throne of Saudi Arabia. This makes the Saudi monarchy quite distinct from Western monarchies, which usually feature large, clearly defined royal families and orders of succession, and use the absolute primogeniture system of succession. Muhammad bin Nayef was the first grandson of Ibn Saud to be in the line of succession before being deposed from the position of Crown Prince by a royal decree in 2017. Saudi Arabia is ruled by Islamic law (Sharia) and is an Islamic state. The King of Saudi Arabia is also considered the Head of the House of Saud and Prime Minister. The Crown Prince is also the "Deputy Prime Minister". The kings after Faisal have named a "second Deputy Prime Minister" as the subsequent heir after the Crown Prince. Crown Prince: Mohammad bin Salman, born (1985-08-31) 31 August 1985 (age 33); son of King Salman and Fahda bint Falah bin Sultan Al Hithalayn. The Royal Standard consists of a green flag, with an Arabic inscription and a sword featured in white, and with the national emblem embroidered in gold in the lower right canton. There is no other god but Allah, Muhammad is the messenger of Allah. ^ Rabasa, Angel (2004). The Muslim world after 9/11. Rand Corporation. p. 164. ISBN 978-0-8330-3712-1. ^ "About Saudi Arabia: Facts and figures". The Royal Embassy of Saudi Arabia, Washington D.C. Archived from the original on 17 April 2012. Retrieved 24 April 2012. Faisal bin Abdulaziz Al Saud was King of Saudi Arabia from 1964 to 1975. He emerged as an influential royal politician under his father King Abdulaziz and brother King Saud. While crown prince in 1962, Faisal outlawed slavery in Saudi Arabia. He persuaded King Saud to abdicate in 1964 with the help of other members of the royal family and his maternal relative the grand mufti of Saudi Arabia, and Faisal became king. 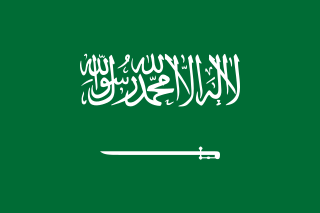 The flag of the Kingdom of Saudi Arabia is the flag used by the government of Saudi Arabia since March 15, 1973. It is a green flag featuring in white an Arabic inscription and a sword. The inscription is the Islamic creed, or shahada: "There is no god but Allah; Muhammad is the Messenger of God". Khalid bin Abdulaziz Al Saud was King of Saudi Arabia from 1975 to 1982. His reign saw both huge developments in the country due to increase in oil revenues and significant events in the Middle East. The House of Saud is the ruling royal family of Saudi Arabia. It is composed of the descendants of Muhammad bin Saud, founder of the Emirate of Diriyah, known as the First Saudi state (1744–1818), and his brothers, though the ruling faction of the family is primarily led by the descendants of Ibn Saud, the modern founder of Saudi Arabia. The most influential position of the royal family is the King of Saudi Arabia. King Salman, who reigns currently, chose first his nephew and then his son as the crown prince without consulting the Allegiance Council. The family is estimated to comprise 15,000 members, but the majority of the power and wealth is possessed by a group of about 2,000 of them. The Emirate of Diriyah was the first Saudi state. It was established in the year 1744 when Muhammad ibn Abd al-Wahhab and Prince Muhammad bin Saud formed an alliance to found a socio-religious reform movement to unify the many states of the Arabian Peninsula and free it from Ottoman rule. In 1744, both Muhammed bin Abd Al Wahhab and Muhammad bin Saud took an oath to achieve their goal. Marriage between Muhammad bin Saud's son, Abdul-Aziz bin Muhammad, and the daughter of the Muhammad ibn Abd al-Wahhab helped to seal the pact between their families which has lasted through the centuries to the present day. The Sudairi Seven, also spelled Sudairy or Sudayri, is the commonly used name for a powerful alliance of seven full brothers within the House of Saud. Their father King Abdulaziz 'Ibn Saud' had more sons with their mother Hussa Sudairi than he did with any of his other wives. They are also sometimes referred to as the Sudairi Clan or the Sudairi faction. 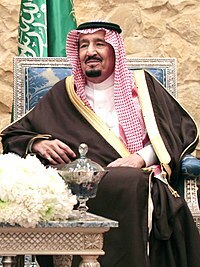 Salman bin Abdulaziz Al Saud has been King of Saudi Arabia, Prime Minister of Saudi Arabia, and Custodian of the Two Holy Mosques since 23 January 2015. Muhammad bin Abdulaziz Al Saud was a member of the House of Saud. The order of succession to the throne of Saudi Arabia is determined by, and within, the House of Saud. Every King of Saudi Arabia upon his death, has been duly succeeded by the crown prince, with a new crown prince then being appointed according to agnatic seniority among the sons of Ibn Saud, though various members of the family have been bypassed for various reasons. A deputy crown prince was first selected in 2014. Mishaal bin Abdulaziz al Saud was chairman of the Allegiance Council and a senior member of the House of Saud. He held different cabinet posts in the 1950s. The unification of Saudi Arabia was a military and political campaign, by which the various tribes, sheikhdoms, city-states, emirates, and kingdoms of most of the Arabian Peninsula were conquered by the House of Saud, or Al Saud, between 1902 and 1932, when the modern-day Kingdom of Saudi Arabia was proclaimed under the leadership of Ibn Saud, creating what is sometimes referred to as the Third Saudi State, to differentiate it from the Emirate of Diriyah, the First Saudi State and the Emirate of Nejd, the Second Saudi State, also House of Saud states. The Kingdom of Hejaz and Nejd, initially the Kingdom of Hejaz and Sultanate of Nejd, was a dual monarchy ruled by Ibn Saud following the victory of the Saudi Sultanate of Nejd over the Hashemite Kingdom of the Hejaz in 1925. It was the third iteration of the third Saudi state. Muhammad bin Nayef Al Saud is a prominent member of the House of Saud. He is a nephew of King Salman and grandson of the founding monarch King Abdulaziz. He has served as First Deputy Prime Minister and Minister of Interior of Saudi Arabia and chairman of the Council for Political and Security Affairs. On 29 April 2015, he was appointed Crown Prince by King Salman, making him first in line to the throne of Saudi Arabia. On 21 June 2017 he was replaced as Crown Prince and First Deputy Prime Minister by the king’s son, then Deputy Crown Prince Mohammad bin Salman, and relieved of all positions by royal decree of King Salman. The Allegiance Council, also known as the Allegiance Commission or Allegiance Institution, is the body responsible for determining future succession to the throne of Saudi Arabia. It was formed on 7 December 2007 by King Abdullah. At the time of its formation, the Council's intended function was to appoint a Crown Prince once a new King succeeds to the throne. The Crown Prince of Saudi Arabia is the second most important position in Saudi Arabia, second to the King, and is his designated successor. Currently, the Crown Prince assumes power with the approval of the Allegiance Council after he is appointed by the King. This system was introduced to the country in the Abdullah Era. In the absence of the King, an order is issued to have the prince manage the affairs of the state until the king's return. The order changes the prince's title temporarily from the Crown Prince, Deputy Prime Minister to Vice Custodian of the Two Holy Mosques until the return of the King to the kingdom. The Crown Prince is also the Vice President of the Council Of Ministers & the first deputy prime minister of Saudi Arabia. The Ministry of Education is a ministry in Saudi Arabia. As of December 27, 2018, Dr.Hamad bin Mohammed Al Al-Sheikh is the minister. Headquartered in Riyadh, it oversees primary, secondary, and higher education. Ibn Saud (1875–1953), the founder and first king of Saudi Arabia, was very young when he first married. However his wife died shortly after their marriage. Ibn Saud remarried at eighteen and his firstborn child was Turki. He had 45 sons of whom 36 survived to adulthood and had children of their own. He also had many daughters. His number of wives is put at 22.